A $1.2 million donation to transform Cambridge University Library’s exhibitions will allow its priceless treasures to be shared with the world as never before. 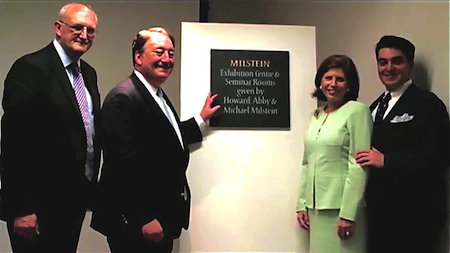 The gift from the Howard and Abby Milstein Foundation will enable the University Library to reimagine the way in which it displays its collections in both the physical and online worlds. Work on transforming the Library’s ability to exhibit its collections is already underway. Two new exhibition cases have been placed in the Entrance Hall, giving visitors instant access to the University Library’s collections and encouraging them to further explore the refurbished exhibition centre, which also now includes ‘Turning the Pages’ technology. 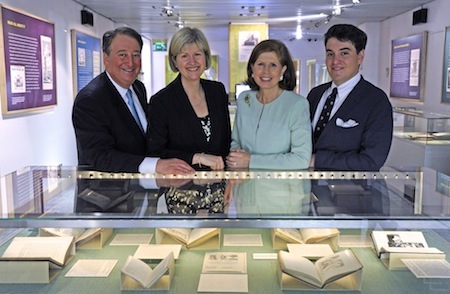 University Librarian Anne Jarvis said: “The Milsteins’ generous gift is of immense value to the University Library, as it will facilitate the sharing of the Library’s cultural and educational resources, not just with the Cambridge academic community and visitors, but with the world, through our online exhibitions. Potentially, any book, manuscript, map, or photograph can become a virtual exhibit, and the Library will now be able to build a rich gallery of images to do justice to its extraordinary collections. Before the unveiling of a plaque to mark the official naming, Anne Jarvis, Vice-Chancellor Sir Leszek Borysiewicz, Michael Milstein, and Howard Milstein spoke. Michael Milstein, who works alongside his father and is an advisor to the Nexus Global Youth Summit, spent six months at Pembroke College studying history as part of his degree course at Cornell University. He spoke of his family’s pride at being able to help the Library achieve its mission of sharing its collections with the widest possible global audience. Cambridge University Vice-Chancellor Sir Leszek Borysiewicz, with Howard, Abby, and Michael Milstein at the opening of the Milstein Exhibition Centre and Seminar Rooms. Howard Milstein, Cambridge University Librarian Anne Jarvis, Abby Milstein, and Michael Milstein in the Milstein Exhibition Centre and Seminar Rooms.